Could it be a love/hate relationship? Ever been in a car which from the get go you really did not want to like? I have to admit that was the case with yours truly when I picked up the 2013 Dodge Dart Rallye. So let’s put that phrase into context, shall we? As soon as I saw the car, my hackles went up; what was this bright red car (to be technically correct, Redline Red Pearl Coat)? And just who was it trying to mislead? The answers? It’s a Dodge Dart and it made a fool of me. With the introduction of this vehicle, execs on both sides of the border can breathe a sigh of relief. However, for the record, it will take more than one model to eliminate some of the bad taste that is still lurking reluctantly with some faithful Chrysler consumers who in the past five years or so have been wondering what was going on with their beloved yet smallest manufacturer of the Big Three. There may well be a light at the end of the proverbial tunnel and it may be an advancing Dart, heading to market via dealerships everywhere waiting like an eager puppy to make loyal Chrysler consumers believe again. Like many of my colleagues I drive a fair number of vehicles every year. However, this particular model got a total of five direct unsolicited responses from various inquisitive consumers. Five. Not the norm. There may have been more, but these five I personally witnessed including one couple who wandered up my driveway to peer inside this red machine. Even the attendant at the car wash I usually frequent early Monday mornings made a comment. At best, if I get “Have a nice day” you know that he long before fulfilled his daily caffeine quotient. This day he was, for him, quite effusive. So what is it or was it about this car that seemed to cause these reactions? Its European heritage? Perhaps. After all taking a vehicle that sells as an Alfa Romeo Giulietta in Europe and making it work for North America is a fairly straightforward proposition. Cars like the Golf, Focus, and Cruze are very similar to their foreign market counterparts. But the very (resurrected) name of the 2013 Dodge Dart suggests Chrysler feels this car has an important role to play within Chrysler hierarchy. What, precisely remains to be seen. The vehicle as tested had a price tag of $25,085. Not bad, but not wonderful either, considering other vehicles in the category, such as the Chevy Cruze, Ford Focus, Honda Civic. Nissan Sentra, Hyundai Elantra, Mazda3 and the Volkswagen Jetta. But again, the model I was driving was, perhaps a little sportier than many comparable models. 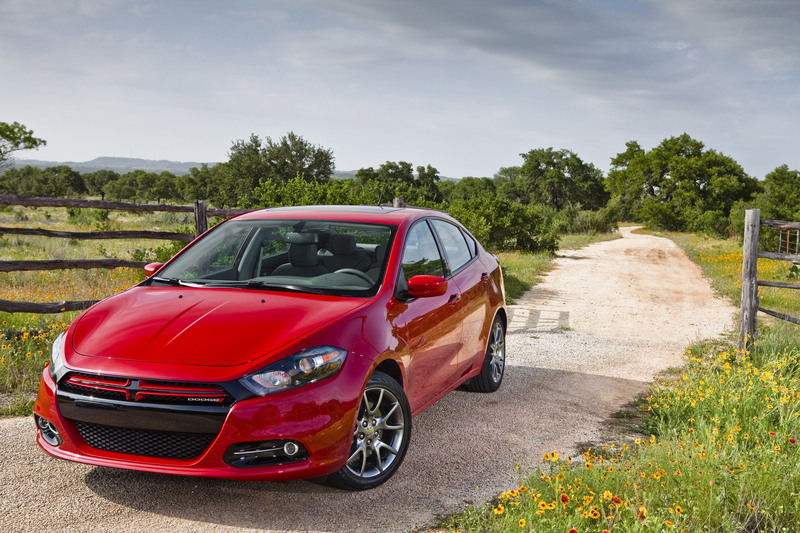 The Dart’s entry-level engine is a naturally aspirated 2.0-liter I-4 with 160 hp and is mated to a six-speed automatic transmission. I drove the higher spec engine; also 160 hp, but with a turbo feeding a 1.4-liter I-4 that transfers its power through a six-speed manual. The big difference between the two engines is torque. While the 2.0-liter twists out 148 lb-ft, the 1.4-liter turbo gives the driver 184 lb-ft.Alright then. I have to confess for the first few days I wondered aloud about this. Was the turbo broken? Since it never really seemed to ‘respond’ and there was no obvious visible indicator advising said extra ‘oomph’ had been engaged. Until late one evening driving north on Hwy. 400, that was. Minimal traffic, I cruised along in the right hand lane at 105kmh. With no other vehicles of any description anywhere close, I dropped from 6th to 4 and gave the willing engine the gas it craved. OK, so no appreciable turbo lag (revs were high) and the car behaved and responded quickly – and willingly. So the turbo was there – it had been resting, never really having a chance to show or prove itself until then. OK, so we know the car can move. What else? The transmission was pretty good – everything did what it was supposed to – when it was meant to – always a good sign. This particular testing model was not what could be called luxurious. It was a ‘driver’s’ car – including the well-bolstered bucket cloth seats. It came with navigation and even heated seats – never really understood heated cloth seats, but… Back up camera made its now almost ubiquitous appearance as did 17×7 ½” aluminum wheels, fog lamps, leather-wrapped steering wheel and available satellite radio. At night, the interior of the car, especially the dash, was, for this driver a bit too much – but in fairness, I’m not the dart’s demographic. I came close to a combined EnerGuide Government of Canada city highway rating of 5.1L/100km – not too bad. Like I said, at first, I could not see myself liking the Dart. When I turned it back in, I still had a smile (albeit faint) on my face. We’ll all need to keep an eye open for Chrysler and their future. Can they do something engineered from the wheels up via Detroit? We’ll see. We’ll see.